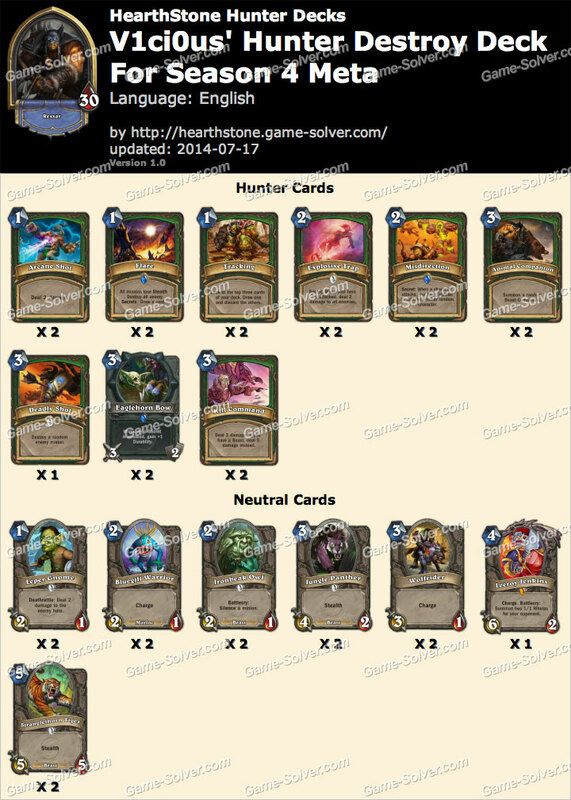 This is a Hunter aggro deck designed by v1ci0us that is based on traps like Misdirection and stealth minions which work wonders against popular decks like Miracle Rogue, and Freeze Mage. It should be able to counter Shaman and Hunter perfectly as well. Arcane Shot – Most of the time, Arcane Shot will be used to burst down your opponent. So try to hold on to it and not to use it as a board clear if possible. Flare – A one mana deck cycler which is useful in the current meta. When you have that extra one mana to spend, do not hesitate to cycle unless if you are facing Hunter, Miracle Rogue or Freeze mage. Tracking – Another deck cycler which will be used during turn one to find a valuable turn three play with priority on Eaglehorn Bow. Even when drawn in mid game, Tracking will always find a good use. Explosive Trap – Explosive Trap will work very well against aggro decks, and at the same time will give you an extra charge on the bow. Misdirection – The most important strategy of this deck is to deal extra damage. Together with Bluegill Warrior, this is a good turn two play. During the early phase, lots of decks like to play with a single creature, and our goal is for Misdirection to deal 3 to 5 damage to the opponent’s face when the secret is triggered. It is also common for players to expect an Explosive Trap and attack with the single creature to trigger the secret prior to playing other minions which will be advantageous to us. Animal Companion – Usually a good turn three drop with a probability to get a 4/4 minion with taunt, 4/2 minion with charge or 2/4 minion which buffs your other minions. It also combos well with Kill Command. Deadly Shot – Would be your only way to remove cards like concealed Gadgetzan Auctioneer and very useful to remove nasty minions like Ragnaros the Firelord. Eaglehorn Bow – This weapon could be played on turn three against aggro decks or turn five together with a secret which would buff the weapon. Kill Command – Pure damage card which is often used as a finisher. Leper Gnome – Strongest turn one play for aggro decks, and at the same time, also works fine in late game due to the 2 damage deathrattle. Bluegill Warrior – Bluegill Warrior will work well as an early aggressor or for an extra damage in late game. Ironbeak Owl – The Silence effect of Ironbeak Owl will be used primarily to remove taunts as well as combos pretty well with Kill Command. Jungle Panther – The main strategy of this deck is to go for your opponent’s face. Jungle Panther fits this role perfectly, being able to hit at least once and your opponent are forced to trade with it after it reveals itself. It also combos well with Kill Command. Wolfrider – This card synergizes well with an aggro deck which is perfect as a turn three direct damage or finishing move. Leeroy Jenkins – This card belongs in every aggro deck, and will only be used as a finisher. Stranglethorn Tiger – Perfect turn five drop usually to be followed by Ironbeak Owl or Kill Command the following turn in case of taunts.